Zhoushan, a city in Zhejiang province, is the first prefecture-level island city in China. It is located at the intersection of the Yangtze River and the East China Sea. Zhoushan has 1,390 islands and over 270 kilometers of deep-water coastline, and a permanent population of 1.146 million. It is the largest archipelago city and an important port city in China. Zhoushan is divided into two districts and two counties, Dinghai district, Putuo district, Daishan County and Shengsi County. 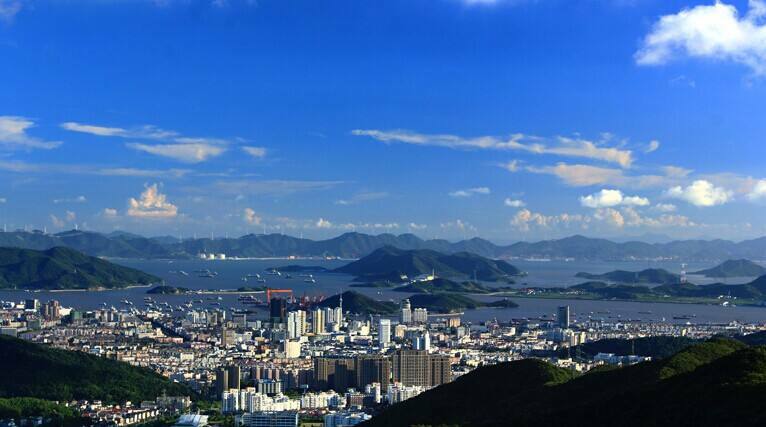 Zhoushan Archipelago New Area was officially approved by the State Council on June 30, 2010. It is the fourth state-level new area after Pudong New Area in Shanghai, Binhai New Area in Tianjin and Liangjiang New Area in Chongqing. It’s also the first national new area focused on marine economy. According to the Development Planning for Zhoushan Archipelago New Area issued by the State Council on January 17, 2013, Zhoushan should become a driving force in economic marine development, a pilot for comprehensive marine development, and an important economic growth pole in the Yangtze River Delta. The plan also declared that Zhoushan Archipelago New Area should develop itself into a center for storage, transit shipment, and processing and trade of bulk commodities, an opening- up gateway island-city in East China, an important modern marine industry base, and a model area in protecting and developing ocean and islands industries in a comprehensive way, striving to become an economic bridgehead in the Pacific rim. Zhoushan has a profound cultural heritage. In the Neolithic age, as early as 5,000 years ago or more, industrious and intelligent ancestors created a splendid civilization called “Hemudu on the Sea”. Zhoushan was named Haizhongzhou in ancient times and Yong Dong during the Spring and Autumn Period (770-476 BC). In the Emperor Kaiyuan Period of the Tang Dynasty (AD 618-907), the royal court set up Wengshan County (Zhoushan now), while in the Emperor Xining period of the Song Dynasty (AD 960-1279), the county was named Changguo. In the Kangxi period of the Qing Dynasty (AD 1644-1911), it was called Dinghai County. Known as “Buddha World amidst Sea and Sky” and “City of Fishery and Port”, Zhoushan attracts over 55 million tourists every year with its enchanting island scenery. It boasts blue sky, clear water, sandy beaches, seafood, Buddhist culture and clean air, and has ranked among the top three of 74 major cities around China for many years. Since its establishment the Zhoushan Archipelago New Area has served as a strategic base for construction of a major maritime city. The municipal government has clarified that the construction goal for the Zhoushan Islands is to create an international logistics center, an opening-up gateway, a leisure eco-island city, a garden city on the sea and a service hub for river-sea interconnected transportation.